Hiya! This post is actually coming at you from the archive, because 1) I couldn't bear to take off my little goat for quite a few days after my last post, and 2) I've been preparing for a trip to Perth in a few days! A great friend of mine is getting married! :D I'm doing nails for the bride and her wedding party, so I have a whole wheel of bridal-themed nails I'll show you, as well as pics of theirs, when I get back! I did this manicure soon after I received my last Born Pretty Store haul, and I consider it a fail. 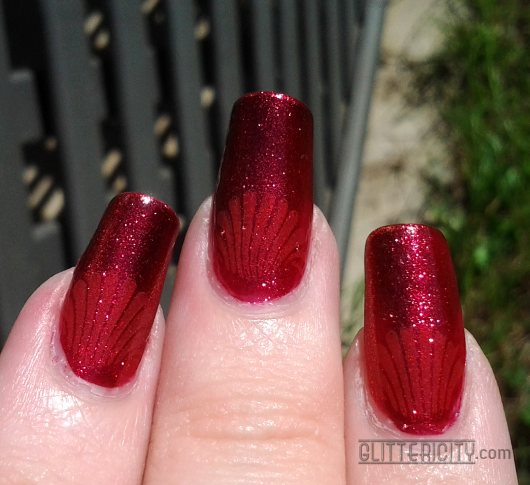 It was a lot prettier in my head, but the red I chose for the base colour was just too similar to the red BPS stamping polish, and it barely showed up. I didn't post it at the time... But I figured I should show you anyway--it was pretty at some angles, and definitely falls into the "subtle stamping" category. 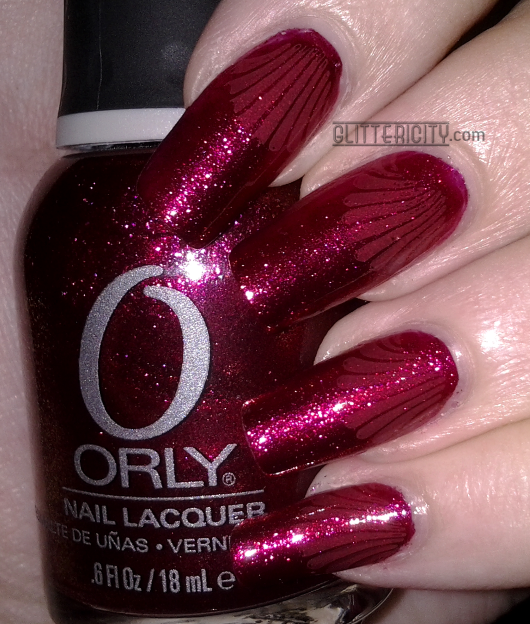 The base is two coats of Orly Rock-It, one of the prettiest red polishes of ALL TIME. 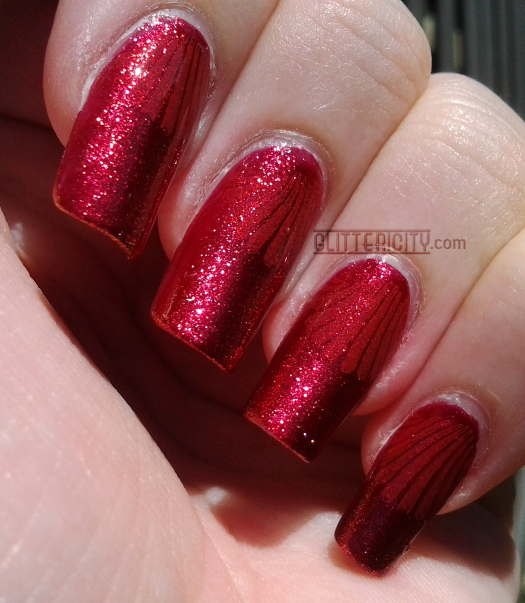 Deep and shimmery and foily and awesome. 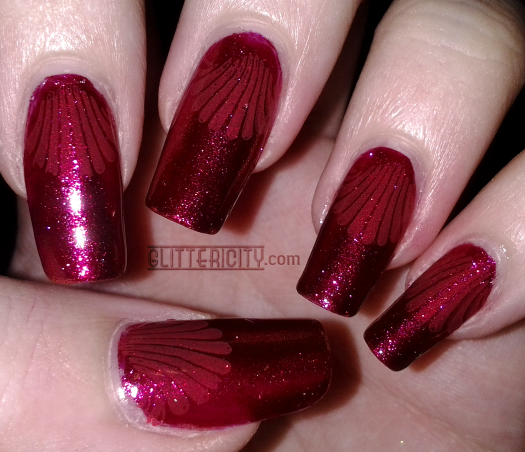 I wanted it to contrast with the lighter red creme of the Born Pretty Store red stamping polish. And it did, kinda. In the bottles they look very different, but in the thin stamping layer it wasn't quite different enough. It's good for a chic look when you only want a hint of art showing, I suppose! 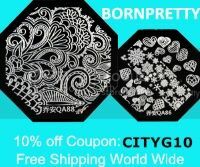 The stamp is from Bundle Monster plates BM09 and BM-009. The original and "remastered" set. I love having them both, because the re-release plates have bigger images, so I had a bigger one for my thumb and first few nails, and a smaller one to fit my ring and smallest fingers! It makes for a more proportional look. I've finished it all off with Seche Vite topcoat. The index and middle finger are what they looked like the majority of the time. Just barely-there.